An ad blocker is a program or software designed to remove or change advertisements during a user’s web browsing experience. These programs or software are available for different devices – mobile, desktop computers – therefore, ads on webpage, websites or mobile apps are common targets of these programs. Ad blockers are particularly popular among young internet users. It was found that 20 percent of internet users aged between 16 and 34 used ad blockers in 2016. Considering a large share of online publishers rely on advertising as a major stream of revenue, ad blocking has an economic impact amongst online publishers. Over a period of one year, the global cost of ad blocking nearly doubled, adding up to more than 40 billion U.S. dollars in 2016. In line with the global trend, the use of ad blockers in the U.S. is on the rise. 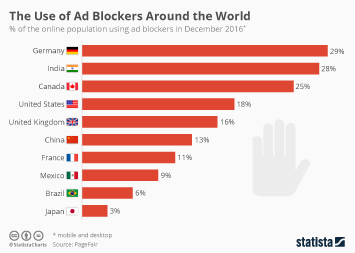 However, the U.S. is not amongst the leaders in ad blocking use. About 22.5 percent of ad page views were blocked in the U.S. In comparison, just over 42 percent of ad page views were blocked in Poland, the leader in ad blocking use in the world. The number of ad blocking users in the U.S. is forecast to increase from about 70 million in 2016 to just over 86 million in 2017. In 2016, about 26 percent of internet users in the U.S. used ad blockers, while further 17 percent stated they are likely to use an ad blocker in the near future. As a consequence of the increasing use of this type of software, the cost of ad blocking in the U.S. also doubled between 2015 and 2016. The loss of revenue due to ad blocking reached more than 20 billion U.S. dollars in 2016. One of the main reasons for the use of ad blockers outlined by Americans is unwanted pop-up ads. Internet users in the U.S. stated that they do not want to deal with them. They also said they use the software because they are tired of being bombarded by ads. Lastly, about a quarter of Americans stated that they find ads on non-media social sites annoying, adding another reason to make use of the ad blockers. Mobile ad blocking is a growing trend in this industry. The number of monthly active users of mobile ad blocking browsers worldwide has been constantly increasing since early 2015, when there were little less than 200 million mobile ad blocker users in the world. This figure stood at 376 million in 2016. There is a growing interest in mobile ad blocking. During a recent survey, about 80 percent of the respondents aged between 25 and 34 said that they had used an ad blocker on their mobile phones in the month leading up to the survey, or were interested in doing so. China is a clear leader in mobile ad blocking use with 159 million monthly active users; India follows with 122 million. There were 2.3 million monthly active users of mobile ad blocking browsers in the U.S. in 2016. About 67 percent of smartphone users in the U.S. are aware of ad blockers but have never used it, and only 15 percent of smartphone users in the U.S. stated using this type of software.